Imagine being able to withdraw from your nearest Maybank ATM without using any ATM card. Imagine no more, as the latest new service from Maybank was launched recently, the Maybank Cardless Withdrawal service. 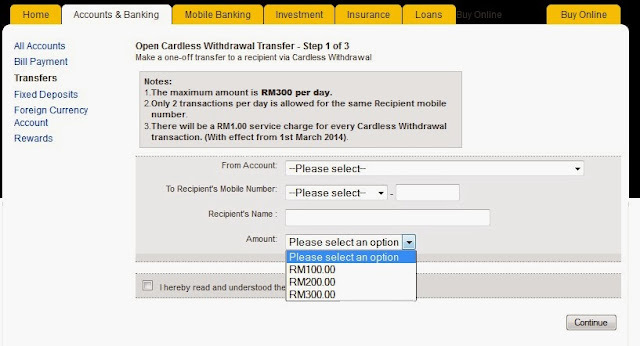 The convenience of sending and receiving cash with Maybank without the need for the ATM card. How does it work? Read on below then. The first of its kind in Malaysia, this new service by Maybank will enable the Bank’s customers to perform simple and easy person-to-person fund transfer payments. The introduction of this Service will revolutionise the way people send and receive money because the recipient can withdraw without an ATM card! 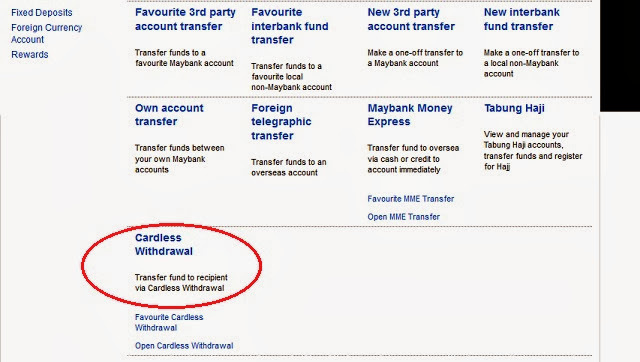 The Cardless Withdrawal Service enables Maybank2u users to initiate a fund transfer to anyone, even if the person is not a Maybank customer. Once a transfer is done, the Recipient will receive a secure code via SMS to perform the cardless withdrawal at any Maybank ATM Machines in Malaysia without requiring an ATM Card. A couple of key features that are worth to be mentioned here would be the fact that the latest Maybank Cardless Withdrawal service works at any of the 400 over Maybank ATMs nationwide. No ATM card required for the withdrawal, and the recipient does not even need to be a Maybank customer. How cool is that? This means you can actually utilize this service to send money to yourself or virtually anyone nationwide. Here’s a step-by-step pointers on how to get it done, check out the procedures below. I have included some screenshots taken from Maybank2u's website for more clarity. 1. Log in to Maybank2u. 2. Click ‘Transfer’ then ‘Cardless Withdrawal’. 4. Click ‘OK’ to confirm. The Recipient will be notified via SMS regarding the initiated transfer. The Recipient will also receive a transaction ID via SMS and will need to obtain the withdrawal code from the Sender. The transfer must be encashed at a Maybank ATM Machine in Malaysia within 24 hours. 3. Key in the Transaction ID and Withdrawal Code given to you. Now there are a couple of scenarios which I feel this Cardless Withdrawal system can be utilized, especially in our everyday lives. A good example would be, if *touchwood* I were to lose my wallet, or forgot to bring out my Maybank ATM card, a quick Maybank2u access, and I would be able to send cash to myself from my own Maybank2u account. I can literally press out the cash from the nearest Maybank ATM machine without my ATM card with the Transaction ID and Withdrawal Code obtained. 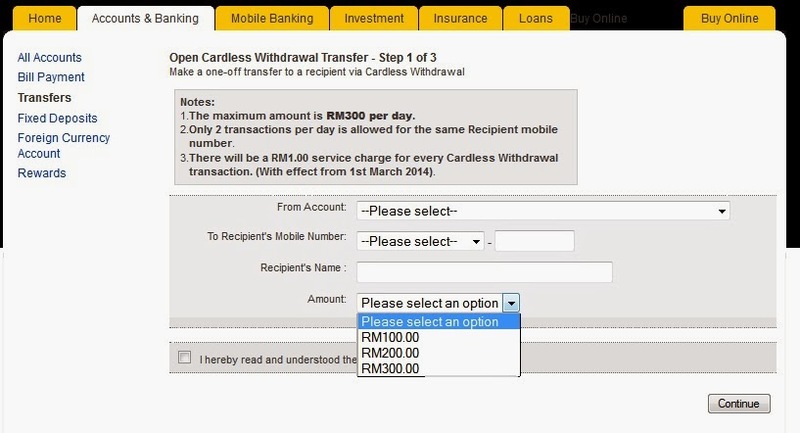 On top of sending cash to yourself, the new Maybank Cardless Withdrawal service can be used for sending cash to your parents, and probably if you're renting, pay your landlord conveniently and effortlessly. This is a fast and convenient way to send cash funds to your family and friends when they need it the most. Not on Maybank2u yet? Well, here's how you can activate it. Check out the video below. Hey thanks for the useful info! Wow, imagine how fast technology is!